The small, brightly painted traditional Thai long tail boat was racing along the mighty Mekong River so quickly the ripples sounded like we were smacking rocks. We flashed past the huge Buddha marking the Golden Triangle – ahead was Burma, to my left Thailand and to the right Laos. And here is our resort, my lovely guide Tuk yelled in my ear. She was pointing to a hill of thick bright green jungle and a rather decrepit looking landing. Resort? Not that I could see. Soon we were walking along a muddy track to a small clearing where I was presented with a freshly opened coconut. If you don’t drink it all don’t worry Tuk said – Bo loves coconuts. We moved around the first bend and as I looked up the track there he was – a magnificent sight as he waited patiently with his mahout (owner/trainer/lifelong friend) of 20 years, Berm. His trunk snaked in my direction as I arrived - firstly I guess to assess this intruder but mostly to accept his gift, which he took out of my outstretched hand with extraordinary dexterity and popped into his mouth. CRUNCH – it reminded me of eating a Smartie - giant jaws sent milk squirting out of each side of his mouth. Now it was time for me to climb up steps and gingerly hop on to a saddle behind the mahout. Shades of playing Maharaja. I nervously grabbed the base of the saddle with both hands as Bo lumbered away until I got used to the rather disjointed movement – swaying in the breeze four metres up in the air. Finally, my amazing adventure to the Anantara Golden Triangle Elephant Camp & Resort had began. Slow is the rule for these giants – vaguely kept on the track by verbal commands like pai (go forward) and baen (turn) and having the inside of their ears rubbed by the mahout’s bare toes. Touch left and he goes right, I was told. Bo meanwhile had decided suddenly to stick his huge head and trunk high into the sky to rip down and expertly strip a piece of cane - the upwards movement soon had me hanging on with both hands again. Snack over, we sauntered on until we reached a large clearing and the resort finally came into view, peeping out of the jungle at the very top of the hill overlooking the confluence of the Mekong and Ruak rivers. Slowly I was getting used to my ancient form of transport and by the time we arrived at Anantara I felt reasonably relaxed. Bo padded down a guest footpath (the plopping sound is like someone walking on pillows) until he reached a balcony high enough to allow me to step off and head inside. Built 22 years ago, the resort was designed by an architect way ahead of his time – in fact it is still a blueprint of elegant 5.5 star resorts all over Thailand – right down to the huge infinity edge pool. The expansive Sala Mae Nam Restaurant offering Thai or European food with its dark timber floor and pagoda style roof is open to cooling breezes. In the evenings, guests can sip a cocktail from the balcony and view the elephants grazing on open pasture below. The Baan Dhalia Italian restaurant is nearby. The restaurant level leads to the bar and pool area. Arrival is by the resort’s luxury coach via a newly sealed highway from Chiang Rai Airport – or you can take the VIP long boat/elephant option like me at additional cost. Brilliant service with a lovely Thai smile is everywhere – by the second day everyone knows your name. There are only 53 fully equipped and beautifully decorated oversize suites, all with a view, so its easy to find a quiet corner or table far from the madding crowd. Sit by the pool and just relax – or there is a long list of things to do. 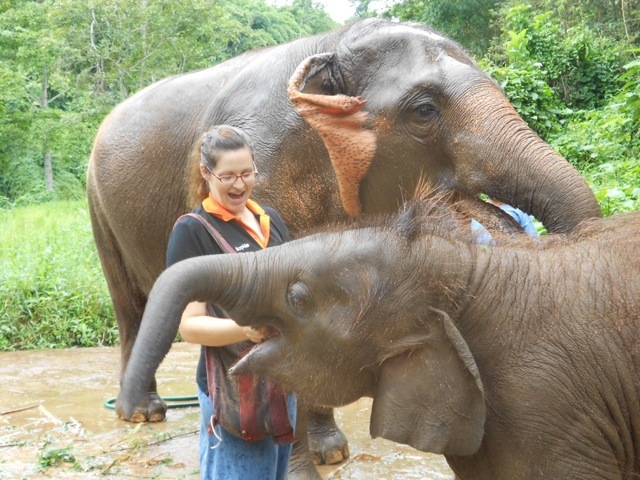 I chose the two most popular experiences – a two hour Walk With The Giants – in this case Boonjan and her already famous 14 month old baby called Suki – and in the afternoon a ride like no other – The Mahout Experience where you somehow clamber aboard a fully grown elephant and call the shots (or so you hope). The walk begins at the nearby elephant camp where 26 giants these days live a very happy and contented life thanks in no small part to the efforts of Australian Sophie Bergin who manages the entire operation. It was not always the case – when logging was banned in Thailand working elephants sadly often ended up in the noisy, polluted streets in Bangkok as their mahouts begged for money to feed them. Following a request by Thailand’s Queen Sirikit Anatara’s Golden Triangle Asian Elephant Foundation, among other organisations, was formed to care for them. Fully funded by Anantara and guest donations, the camp provides a comfy home for the elephants and their mahouts. Both little Suki (one of his five names) and his mother were waiting for us at the camp and quickly headed off for a morning of fun and foraging. No balls or tyres to kick around this morning for the little fellow but newly made sandbags piled up in case the river flooded became his first challenge. He knocked down most of them before digging holes in the nearly sand heap – just like a child at the beach. Soon he was splashing through water in the drains either side of the road – and rolling in the mud. A quick dash up a muddy slope however ended in disaster as Suki slipped and rolled back down to the road. Helped up and wiped down he decided now he was tired and it was time to walk with his mother who was scouring the jungle for gourmet fare – the absolute highlight being fresh new bamboo shoots. The little fellow did nibble on selected plants, but much like a human child is fed by mum for up to three years. It was as surprising as it was rewarding to simply stroll behind them and observe the immense power and intelligence involved in completing simple tasks like eating and playing. You hang on to the tops of those huge flappers by the way until you build up enough confidence to straighten up. My lovely giant was called Lanna. The mahout is alongside of course but you do convince yourself after a while that by using your bare toes to rub the inside ear actually gets the right reaction. In theory tapping the left ear means the elephant ambles to the right. However my newfound confidence plunged when she suddenly spotted a tasty snack in the vegetation by the side of the road and lurched into thick jungle. After carefully selecting a creeper covering high branches she twisted a length around her trunk and ripped the rest down. Only when the snack was finished did she back up and hit the trail again. The all important trunk by the way consists of 40,000 muscles and it takes years before an elephant can take fully advantage of its multitude of uses. Just as I was convinced I was back in control, my four ton plodder decided much to my astonishment (possibly horror) that it was time for a bath. With me hanging on to the tops of her ears again like grim death, she firstly filled her trunk and then blew a fire hydrant pile of happily warm water directly at me before plunging into rich brown coloured depths. The accuracy of the deluge is unnerving – as though she has eyes in the back of her head. Down we went – the elephant next to me disappeared completely – the rider, a newly wed girl from the UK, screaming with laughter. Lanna was now right in her element and for the next 10 minutes or so we splashed about as she happily soaked herself while redefining the joys of taking a shower for me. That night as often hilarious photographs were exchanged, our journey through the jungle on the giants was rightly described as everything from absolutely amazing to the ride of a lifetime. It really is that special. Anantara Golden Triangle Elephant Camp & Resort operates on a luxury all-inclusive basis. The signature discovery package enables guests to choose one activity from four categories for each night stayed, including the elephant camp.